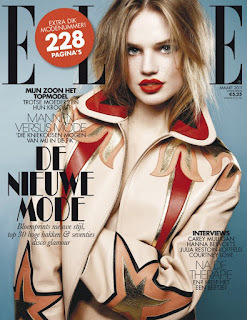 Nineteen year old Dutch newcomer Milou Sluis is generating quite a buzz in fashion industry circles, having landed two high profile Fall/Winter 2011 campaigns for Blugirl and Armani Exchange photographed respectively by Michelangelo Battista and Matthew Scrivens. The 178 cm tall, cherub faced beauty began modelling in 2010 with Ulla Models in the Netherlands and is currently represented by DNA Models in New York. Sluis made her international debut at the Spring/Summer 2011 shows walking in smaller shows like Ashley Isham and most recently appeared in the Philosophy resort 2012 show. Slius bears a striking resemblance to her Dutch modelling compatriots Daphne Groeneveld and Doutzen Kroes, and has the classic beauty that will appeal to designers at the up-coming Spring/Summer shows in September. I for one, am completely transfixed by Slius' incredibly expressive blue eyes, her immaculate bone structure, and her peaches and cream complexion. With such an impressive Fall/Winter campaign coup, Slius is guaranteed to be on the one to watch list of every influential casting director, designer and photographer in town.